If you want to spend a few days in a rural environment, know our house and its surroundings. Opened in 2.016, the house has 6 bedrooms (4 doubles and 2 singles), 4 bathrooms, kitchen and large living room with all the necessary details and amenities to enjoy an unforgettable stay. In the ROOMS you will find spacious and comfortable beds (three double bedrooms with beds of 1.50 m, a double bedroom with a bed of 1.35 m and two simple bedrooms with beds of 1.20 m and 1.05 m). Possibility of expanding the capacity of 10 to 12 people with two extra beds. Free cribs available upon request, full furniture with fitted wardrobes, drawers, hangers, wastebasket, bedside lamps, heating and air conditioning. Casa Rural APOL has interior spaces that offer you the greatest comfort. KITCHEN fully equipped with all kinds of kitchenware and appliances (cutlery, crockery, pots, pans, microwave, washing machine, dishwasher, oven, hob, toast, juicer, coffee maker ...). In all BATHROOMS there are sets of towels, mirror, magnifying mirror, hair dryer, stool and hygiene products. LIVING-DINING ROOM with places in two environments for all occupants and with all kinds of details, television and stereo. Heating and air conditioning throughout the house. PATIOS with outdoor furniture, children's games and barbecue, cozy, designed to regain strength and relax outdoors. 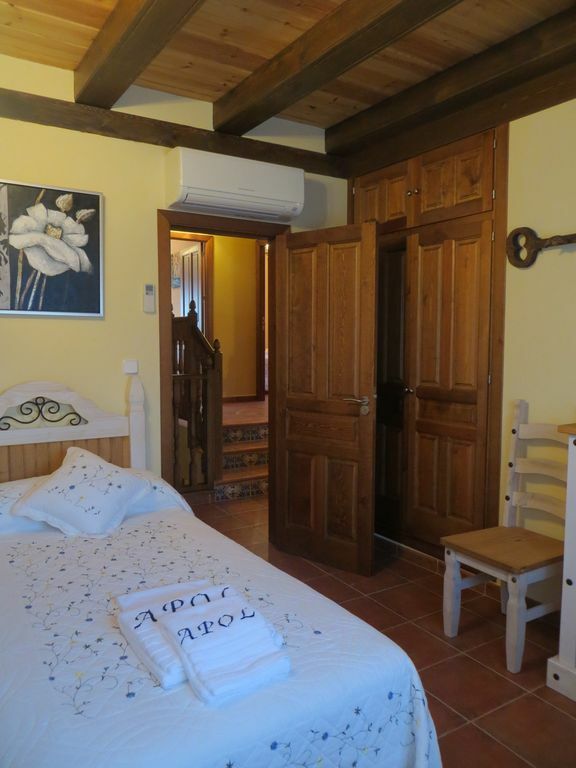 From Casa Rural APOL you will have the perfect location to explore its fantastic surroundings. The extensions of land that surround the house make it the ideal place for you to enjoy with friends or with the whole family in total security. Views of nature, hiking trails, rental bicycles, proximity to cities such as Segovia and Ávila, as well as other nearby municipalities, such as Párraces, which, together with Lastras, complete the Route of the Cloisters. On our website you can find a "environment and gastronomy" section, as well as a wide range of activities that we offer you.